FORWARD Ep. 18 | jibtv.com | Japan International Broadcasting Inc. The city of Kamaishi in Iwate Prefecture suffered catastrophic damages from the tsunami. Many people lost their homes and were dispersed to evacuation centers. As connections to their hometown weakened, they had difficulty gathering the information they needed for everyday life. A newspaper filled the void. 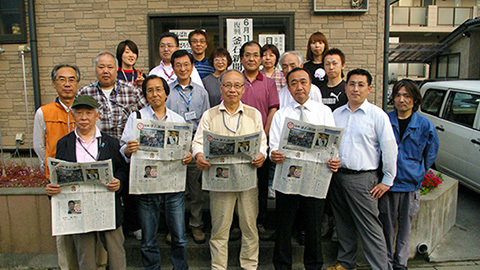 Employees of a local paper started the new publication after losing their jobs to the disaster. It's since become an essential part of the extended community. The program follows the reporters and their commitment to giving readers news they can use.